Official Death Toll In China's 'Eastern Star' Disaster Rises To Nearly 400 : The Two-Way The cruise ship, which was righted on Friday, capsized on Monday in the Yangtze River with 456 people aboard. 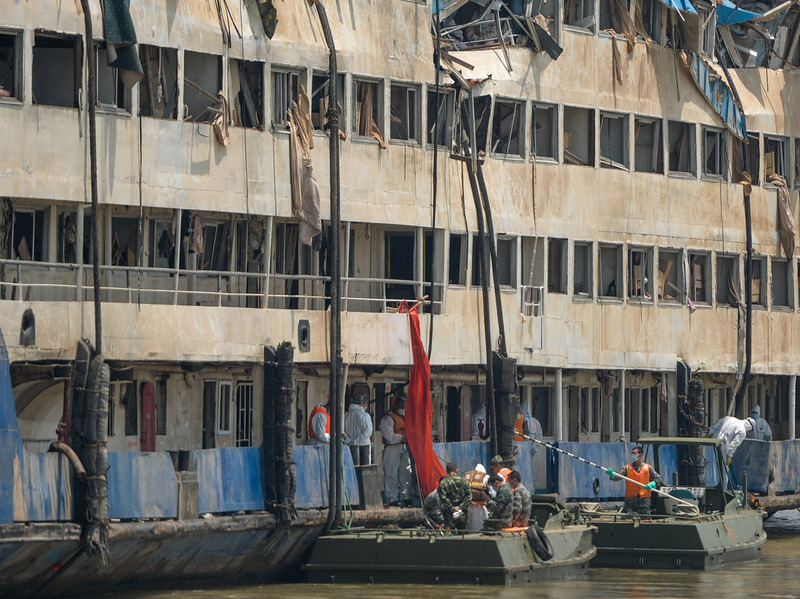 Rescuers work in the hull of the upright ship Eastern Star to launch rescue work in the section of Jianli on the Yangtze River, central China's Hubei Province, on Saturday. The death toll in the capsizing of a cruise ship in China's Yangtze River has risen to just under 400, making it the deadliest maritime disaster in seven decades in the country. China's state-run Xinhua news agency says hundreds more bodies have been recovered since the overturned Eastern Star was righted on Friday, bringing the total confirmed dead to 396. Among the newly recovered bodies was that of a 3-year-old girl. Only 14 people have been found alive and another 46 remain missing of the 456 aboard when the sudden, severe winds on Monday caused the disaster, according to Xinhua. Authorities have placed the captain and his first engineer in custody. The Associated Press says: "Passengers' relatives have raised questions about whether the ship should have continued its cruise after the storm started in a section of Hubei province and despite a weather warning earlier in the evening." "The satellite data show the Eastern Star moving northwest across the river at 9:21 when it suddenly took a sharp turn to the east. A minute later it appears to have spun around violently and begun moving slowly downriver, presumably carried by the current."